Hey Toto, we're not in California anymore. At least that was the case about a week ago when we were in Bend, Oregon visiting family. Getting off the grid for a bit, we left our sweaty Indian Summer down here and headed towards the northern chilled air. I managed to squeeze in a run and a small pocket of explore time between a wedding and a somewhat debilitating cold virus. Bend is a pretty cool place. 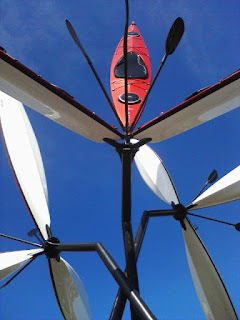 There's public art installations at a few chosen roundabouts downtown... a school of metalwork fish, a super enormous flower made completely out of kayaks, a single funky yellow bird, which, according to my husband, marked the mountain bike trails as well. The Deschutes River was the picture perfect backdrop to a pretty lively downtown. Our first stop in town? The Deschutes Brewery. Had myself a tall pint of the Lug Nut. Awwwwwyeah. After 10 hours of driving, that one would definitely qualify for the tastiest brew award. Sunday was my day to get out and run. I started down by the river near the kayak flower and was glad I brought my VFFs. The surfaces I ended up running on varied quite a bit. Cobblestone bricks, chip and seal asphalt, a slightly splintery wooden bridge and a nicely maintained smooth dirt trail with some solid wooden planked sections. The Deschutes River was a beautiful place to run especially on the singletrack trails. I haven't been on trails since transitioning to barefoot. It was refreshing to be back in my element. Had a small issue with my left knee, which always tends to rear its head on wobbly trails, but it never amounted to more than just a little discomfort. Felt the knot in my calf, but its not sore, just... there. Its a bit smaller these days, but sits deep inside my muscle tissue like a lump. I roll it out before and after every run making sure I do some trigger pointing with a small nerf ball, which is sometimes painful. I think I ran just under 4 miles, but without my Nike Ipod sensor calibrated for barefooting, and no access online to map my run I couldn't be exact. At any rate, it was a good run and the bonus was the beauty of the surroundings and the fun of exploring. I've been reading about this barefoot stuff for a while now and you honestly got me curious. I'm old school when it comes to things like this. Sure, I'm aware of that old timer from CT that's been running barefoot for years. Everyone thought he was a little crazy. I have had problems with my feet before like toe jam. My wife says I have the ugliest feet and fungus under some of my nails doesn't help. Anyway, I think I'm going to do some more research on this barefoot stuff and put something on my blog. I just started my blog too. I'm trying to put together a group of runners to share experiences via blogging. Stop by sometime and share. You've got my interest on this barefoot stuff. Thanks for stopping by Ken! I'll check out your blog. Its nice to have support in this endeavor even if its only online (not too many barefooters in these parts these days). Definitely do your research. Barefooting is not for everybody, but its best to be your own judge about that. No problem, you have a nice blog. I need more actual photos for mine like you do. I had been seeing people throwing around this VFF term and I didn't know what they were talking about at first. The blisters you've gotten make me cringe a bit though. I have two or three friends that have various foot problems like Plantar, bone spurs, and nerve pain. I wonder if those type of things are alleviated or prevented with barefooting? Just curious what you've found out. I might have missed some stuff on your blog. Ken - I have a variety of feet/knee issues: Chondromalacia patella, Morton's Neuroma, over-pronation and a bunion on my right foot. I've had plantar fascitis and some sort of supposed overstretched tendons that was diagnosed when I was a kid (haven't been able to find much info on this). At any rate, I have only been doing the barefoot thing for little over a month and a half, so I can't say for sure whether this form of running alleviates some or all of the issues I have and I certainly don't know if I could have prevented them if I knew about correct form when I was fifteen, but I would suspect so. I do know that since I switched over to a mid-foot landing (I started running with a pose form a couple years ago) I've had fewer issues and less pain while running distances longer than 2 miles. I have not had the neuroma at all while running completely barefoot and very little knee pain. I've had new issues (which I attribute to the transition) like my calf soreness and blisters. So far these things seem to be temporary and correctible by adjusting my form while running. That's just my experience, though. I would suspect that for others it may be easier or harder depending on the individual. You described your knee pain as Chondromalacia patella. That's pain around the kneecap. I understand that this type of pain is often caused by an imbalance between muscles in front versus behind the leg. Have you tried doing what I call a twist stretch? What you do is put the left foot in front of the right and twist the two legs like a pretzel standing. Then you stretch and touch the ground in front of you. This flexes the muscles. Then put the right foot in front of the left and repeat. The other thing that can help is doing some leg lifts with little or no weight. Have you tried circular moleskin patches with a hole in the middle to alleviate some of the pain while using your VFFs? Ken - my doctor informed me that the chondromalacia patella was the wearing away of the cartilage beneath the kneecap (apparently I have very little cartilage under there) which was probably due to overuse when I was younger. I'll have to do some more research on the stretching exercise and maybe try it out. About ten years ago I tried a bunch of things to alleviate the condition, some of which were leg lifts which seemed to aggravate it. Anything that made my leg bend repetitively at a 45 degree angle seemed to make it inflamed. Cycling was the worst. So far I have had little to no pain with these issues running completely barefoot. My bunion hasn't bothered me since switching to pose running either, which I thought was weird, but, hey, I'll take it!